I have just returned home from the most incredible, & enlightening trip from Bali – thus my absence from blogging last week. For those familiar with my 25 before 25 list, you may remember probably not that I had ‘Go on a yoga retreat’ as one of my accomplishments I wanted to do before the age 25. I started this list merely 2 months ago, and can now say I have crossed that off. What started out as strictly a yoga trip however turned in to so much more as I learnt so much about myself travelling alone for 6 days journaling, reading, loving and laughing. I thought as a nice warm up to when this blog turns in to my travel diary as I trek through Europe for 4 and a half months later this year, I’d share with you excerpts from my diary of what I wrote & my treasured photos daily over the next 6 days from my trip in Canguu, Bali. The dream to do a yoga retreat became a reality thanks to Bliss Sanctuary for Women – a luxury resort type villa where I spent my week being pampered, looked after, feed, loved & finding myself. Bliss is everything you could hope for and more. From the moment you arrive and are greeted by the gorgeous hostess you feel like you are home. I had gone to do some yoga, and just treat myself a little – & experience travelling by myself – but truly did get so much more in the end. 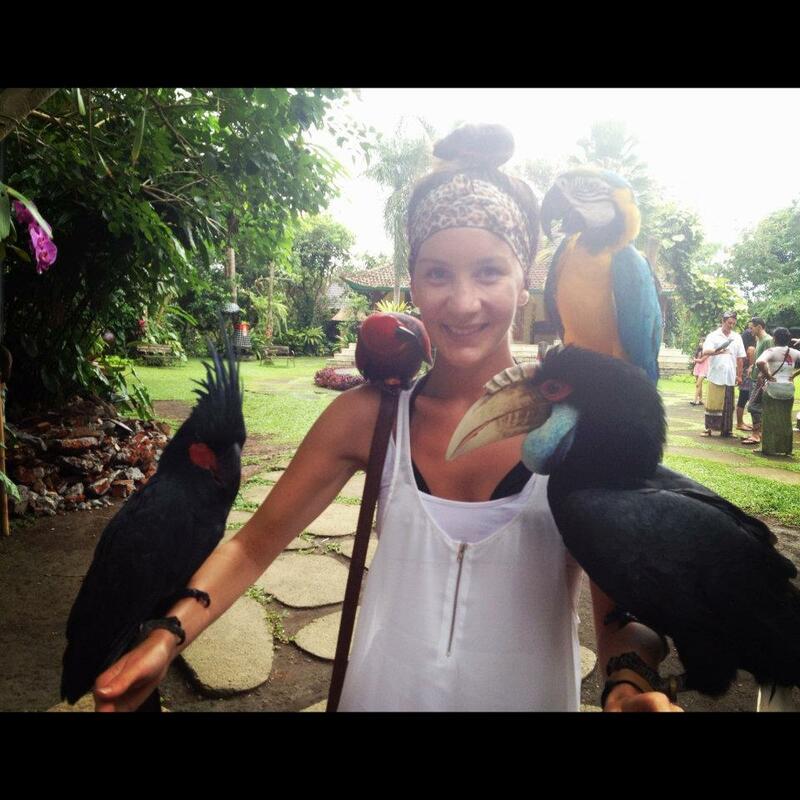 If you are ever wanting to go to Bali or haven’t even thought about doing something like this before…you have to put it on your to do list and look no further than Bliss. The package includes all your meals (we’re talking breakfast, lunch, dinner, snacks, drinks – the LOT), 1.5 hours of pampering a day (facials, hot stone massages, hair treatments,pedicures, manicures, the list goes on – anything and everything you would need), a personal driver, luxury accommodation (in a room above), & Yoga & meditation at a beautiful yoga centre just down the road (which you can bike to or get Putu to drive you to). It really was the best week of my life & something I could never really put in to words just how much you should do it. I will be back – with my mum this time!! Each day we’re to pull 2 cards that give us daily ‘lessons’ to focus on and a word that we must learn from, it’s said the cards pick you, & after today I believe it. Having only known one gear for years now, and that’s GO, my cards were – Calm (I am calm & steady in every situation like a rock in a storm) and Balance. So apt. It’s summed up exactly what I want and need from this week and day one has already set me up with an amazing sense of peace. “I think there’s always a concern with a trip like this that you’ll loose sight of why you came in the first place as you get caught up in the daily going on’s that come with being in a different country and discovering new cultures. I can happily confess that day two of my journey has continued to deliver and I’m learning so much about myself and continuing to grow mentally. I had come in to 2012 with a greater purpose than just my yearly goals. I wanted to learn about true happiness, and ensure that as I continued to strive for success I didn’t feel lost or let down when I achieved it. My mantra for the year was and is ‘it’s not about what I do or what I say in all my relationships and with myself, it’s about who I am and become’ – and this Bali journey was my starting point in embarking on that mantra. In the last two days I have learnt more within myself about calm and balance than I have in the last 3 years and what an amazing gift I feel that is. I’m currently sitting serenely looking over the sparkling pool about to get my hot stone massage but have yet again pulled my 2 cards for the day. They are: Flexible – I am careful yet carefree, determined yet patient, a master & a child, and the word I got is Satisfaction. I can’t believe how much I am getting from just these little lessons I am claiming as ‘meant to be’. I had late last year started to question why I wanted what I wanted in life & feared that when I did in fact start attaining it, that it wouldn’t be enough and I worried about happiness. I know it sounds crazy as why would you feel like that if you had everything you wanted but it happens all the time! Through learning, listening and a tonne of other avenues I’m learning how to live a life centered around strong values & principles so happiness truly does come from within. I can’t wait for tomorrow and to see what it brings. Today could very well have been my day of enlightenment! Is that even possible? It felt like it anyway. Apart from my morning yoga session, which was hatha today, I stayed at the sanctuary all day writing, relaxing and seeing the healers and others who came to visit me. And eating. Gosh you sure can put food away in Bali. The gorgeous chef Alit here can’t understand how I fit in 2 lunches and 4 servings on dinner, I’m putting it down to the fresh air and pure relaxation that is making me so blissfully hungry! I had two really amazing visits today, one from the local ‘healer’ Sammi, and another from a tarot reader Christine who did a reading for me. Sammi works on your body like a physio or masseur would almost and mixes in his intuition in to reading you almost like a psychic would too – he outlined so many things only I would know and I was blown away at how correct he was when it came to all my issues – low blood pressure, kidney pains, low back issues… his visit turned out to be quite emotional as he fixed all aspects of my body (back and low blood pressure to be exact) and sat with me and spoke with me about life and connecting my mental with my psychical more. He wrote out all things I should be doing for better life alignment and assured me that I am and was fine. It’s a strange thing when you find hearing ‘you’re fine’ from a stranger so comforting. After Sammi I had massages and a facial from our masseur on site to relax before the afternoon reading by Christine, which turned out to be also very insightful. I always take anything like that with a grain of salt and caution however and would never let anything they say dictate who I am or what I do. It all was very positive though and she saw lots of success around my career and relationships. Having all this time to myself today though has made me think of Morgan (Mr M to you regular blog readers) so much. I love that absence makes the heart grow fonder and trips away like this affirm how much I truly love and adore him. My 2 lessons for today from the cards are: Unlimited – my mind stays free, above limited, trivial matters below.. and – Courage. I am SO finding my bliss. Day 4 from my time at Bliss Sanctuary for Women where I got a whole lot more than just yoga & relaxation – here I share some more from my journalling I did whilst staying at Bliss. “I can’t believe I’m already at Day 4, only 2 days to go. It’s an odd feeling as I have felt like I have been here longer due to all the growth experiences I’ve had but at the same time, feel like it’s rushed past. One thing I do know is that the 2 women I’ve met here will be life long friends. We keep saying that we were all meant to be here and to have met each other at this exact time in life. Sue & Judy have taught me that I am very lucky and privileged to be where I am at for 23 and to really not take anything for granted and that I need to continue to strive for what I want and who I want to be so I never regret what should or could have been. I’ve been riding my bike to Desa Seni yoga classes everyday and adore the Kundalini yoga there. 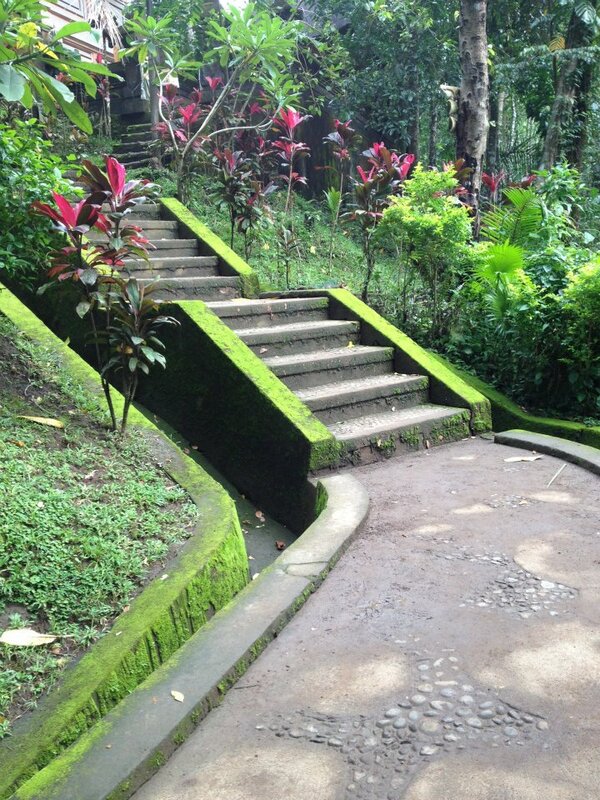 Today was so incredible though, we all went back to Ubud and yet again I got to experience so many beautiful moments. We visited the Antonio Blanco Museum of art – the art was stunning, really sensual actually but it was the grounds the museum was on which made my experience. From there our driver Putu took us to a Buddhist temple to do a blessing if we chose too, I of course did! We got to trek through flights of stairs in what felt like the forest until we found the temple ruins with an elder a top who allowed us to do our own blessing, then did his own blessing on us. I don’t know why, maybe it was because I was so touched by the experience or maybe because it was such fun experiencing another culture, but it was quite emotional. We finished off our day with massages and facials and a big delicious Balinese feast back at the sanctuary. When I got back to the villa I pulled the two cards again and today’s lessons are: Angelic – like an angel I constantly give subtle care and help others and Tenderness. Can’t wait for tomorrow! 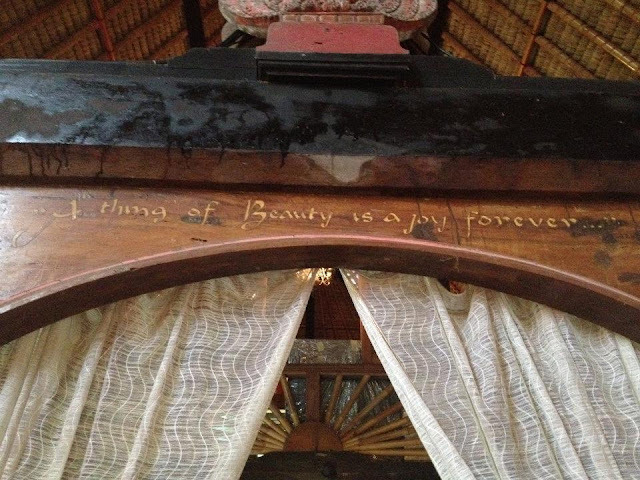 More from my journal about my time on my Yoga Retreat I did through Bliss Sanctuary for Women I had wanted to do before 25 – I can’t recommend doing your own time away here highly enough. It’s my last night in Bali and as sad as I am to say goodbye to my experiences and new friends, I do feel like I’m ready to go home which I’m glad about. I feel like my readiness proves to me like I got out of this trip what I came to get and am ready to go home and continue this exciting new journey I’ve started. I have had the most amazing time and truly believe I was meant to do this trip at this exact moment in my life and meet this incredibly wonderful women. I really want to find a place in Perth that does Kundalini yoga and pick up a class of that once a week as well as my Hatha yoga. I have my last class of it tomorrow morning and I’ll be sad to see the end of the teachings and lovely instructor Daphna. I’m so proud, excited and happy that I finally sat and did all my goals today – Personal development, Career/Financial, Toys/Adventures and Contributory. I am in a different space mentally now and know it will take a whole new level of focus, commitment and persistence from me to make them all come true but I really am so excited by all that my future holds. Today at the villa I just relaxed by the pool and wrote and read. So blissful. Sue the other lady here who is a reiki master did some reiki on me today and it was certainly a new and surreal experience. I wasn’t sure what to expect but I really did feel intense heat and energy. I’m so excited about seeing Morgs and I have missed him so much, absence really does make the heart grow fonder and I’m so lucky he supports me when I want to go off on personal adventures like this one. I jumped in the kitchen today with our chef Alit to learn how to make her amazing banana pancakes, and then a chilli chicken at lunch. 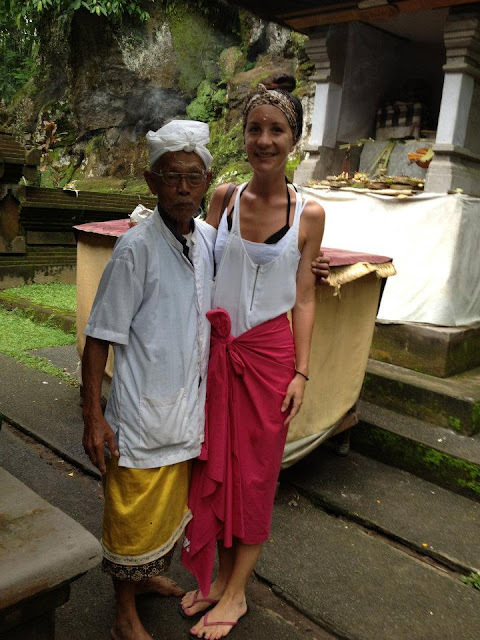 She was so patient and lovely but it is just so the Balinese way. So beautiful. My lessons for today are: Cool – I have a cool head, and a warm heart in all situations and Sensitivity. This is it! The last chapter in the story I have added to my life that has changed me in every way. Even thought it was ‘just’ a week I feel calmer, clearer & more energised and on the right path with life. The lessons I take away from this trip I will remember forever & I am blessed to have found Bliss Sanctuary for Women to have experienced this journey on & with. I’m journaling early this morning as I sit overlooking the pool drinking a coffee listening to all the beautiful birds sing. I’m about to ride my bike the 10 minute journey to yoga for the last time to do the class of Kundalini. I still can’t believe it is esoteric based yoga and I had only just started learning about that before my trip – some things are just meant to be. I do love how life works out like that. As my journey is drawing to an end – I depart bliss at 2pm for the airport, I am filled with real excitement and anticipation. Almost like I now know clearly what I have to do in life for my goal attainment and am ready to do it. I’ve realised a lot on this trip and I want to keep learning and growing when I return home. I also think it no coincidence that I’ve been wanting to learn more about nutrition and food and I end up on the retreat with a vegan raw organic food nutritionist. I can’t wait to get home and start visiting my local farmers market for fresh fruit and veggies weekly. I think my time at the market will be a nice way to continue spending quality quiet time with myself. Another lesson I’ve learnt over here is about not stressing so much over little, or big things. I am in control of my feelings, thoughts and emotions and I have the tools to not work myself up in to stressed states. I have found a beautiful balance and peace over here and I’m determined to emulate that back home. The two card lessons for today are: Patient – my deep inner peace gives me patience to wait and Reflection. How apt. I know I’ll need patience going home and was thinking yesterday how I need to focus on letting things go – small things that are not worth being bothered over. I feel so blessed to have been able to come on this trip and will always cherish the memories I have made. I feel like my lessons learnt are not things to be left here but the start of something much more greater and much more deeper. I am going home to work on living in the moment more. I constantly think about work or business stuff when I’m out with friends or relaxing on the couch or cooking – anytime! So I am going to stop that like I was able to over here. I just need to be and let live and be grateful and aware of my amazing loved ones, conversations and moments in time I’ll never get back so I will be living in them. In 2 hours I’ll be on a big jet plane back to reality and the daily grind where I’ll be challenged to not remember all my beautiful lessons and growth. I have strength however and am on a new level of persistance and determination so I can’t wait to get back and put myself to action.